Charlie was released at the Dudin’s property, central McLeod Bay, in the winter of 2011 as a year old. He wandered northwards from there to the McNamara’s property near Craig Road. The stretch of the main road there has unfortunately proved to be a hot spot for night time traffic kills of kiwi – that is why we put the Backyard Kiwi crossing signs there. 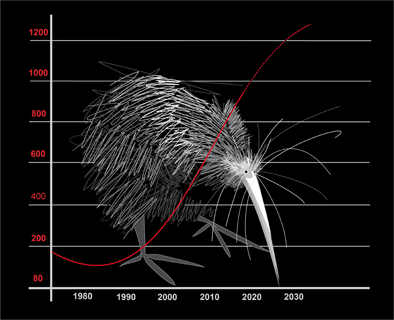 Charlie seems to have better traffic sense then some of the other kiwi and has survived and settled here. He found a mate and started breeding at the end of 2013 and after a few failed attempts at nesting has successful hatched chicks each year since. 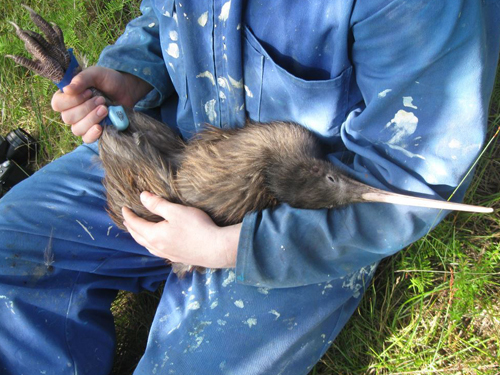 Catherine and James McNamara are keen Backyard Kiwi supporters with Catherine an expert predator trapper. At Craig road. You may remember how I was very lucky to catch Mrs C back in February – she was a wild hatched mate of Charlies – well my luck ran out with monitoring her this month. Her territory is in the rushes and pampas at McNamaras’ and she spends a lot of time knee deep in water in the wetland there. Her transmitter band has been due for a change but she has eluded me (even with helping hands from Adam and Frank) and when Frank and I checked on her last week her transmitter band had broken (possibly weakened from spending time in the wet conditions) so all we found was her dropped transmitter. I have started using a new type of transmitter band attachment designed by Doc’s Rogan Colbourne that will hopefully minimise this problem in the future. Mrs Charlie – At Craig road. High activity. 12 hours per night. Mrs Charlie – at Craig road. High activity. 12.5 hours per night. Mrs Charlie – at Craig road. High activity. 13 hours per night. Mrs Charlie- at Craig road. High activity. 11.5 hours per night. ‘Mrs Charlie’ is at Craig road. High activity. At Craig road, after his successful nest earlier in the season he has had two more nesting attempts that have failed. This is a bit of a crazy story but Charlie dropped his transmitter the night before I went to check him but when I went to check the transmitter’s location he and his mate must have been cuddled up on it because I was lucky enough to catch his mate there. Wary old Charlie had snuck off even though I stalked in as carefully as I could. James and Catherine McNamara have always called Charlie’s mate Mrs Charlie when they hear her calling by the house so that is what we have named her –she is a wild hatched female of 2550g and 141.6mm bill who would not be there if it wasn’t for Catherine’s determined trapping efforts over the past 7 or 8 years. Mrs C is now sporting a new radio transmitter and I inserted an ID chip under skin. At Craig road, as suspected from his high activity his second nesting attempt failed as quickly as it started but he is a persistent dad and is now onto another nest! At Craig road, has renested already but his activity is quite high so the nest may not last. 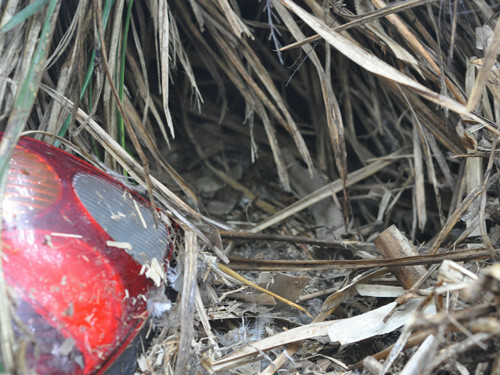 Nested in the pampas beside the main road near our “Kiwi Crossing” signs– he successfully hatched two chicks and had his nest decorated with a car lighting unit from a nearby car crash! See photo. Thankfully he has moved back to his usual stomping ground well away from the road. Still nesting in the pampas beside the main road – jeepers there is plenty traffic going past his nest but he is still hanging tight. I even had to show the Fulton Hogan grader driver where the nest was so he didn’t bowl it during the recent water table upgrade on the road. Hatch is due mid October. Has started nesting in the pampas right beside the main road in our high road kill spot! If he can dodge the traffic he is due to hatch his eggs around mid-October. Has moved a few 100m south of his usual area and has been hanging out on the roadside near the Craig road intersection area – our high road kill area!! His activity is dropping. Usual area at Craig Road. Very active at 13.5 hours per night – he is getting up at 4.30pm!– so he must be feeding up large. Usual area at Craig Road. A very active 12.5 hours per night – feeding up for the breeding season. Usual area at Craig Road. After nesting 87 days his data stream showed a chick had hatched but I couldn’t safely get to the nest in deep gorse and pampas so waited until he finished nesting to do his transmitter change. 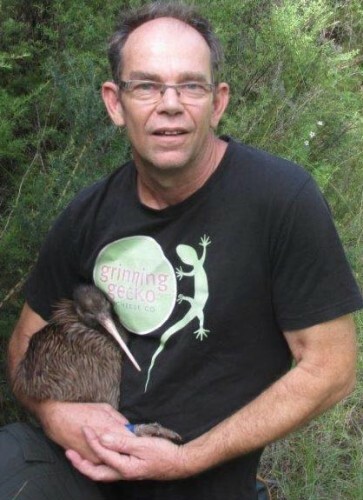 Landowner James McNamara was home after winning the national cheese awards – (Grinning Gecko Cheeses have been great supporters of Backyard Kiwi) and was very happy to see Charlie right in his backyard. Usual area at Craig Road- nesting over 80 days with no signal for hatch- the transmitter may have missed it the change in activity. His activity has been up on a couple of nights but his nest is in pampas and rushes and is too dodgy to check until I’m sure he has finished nesting. Craig Road at McNamaras’. Still on his nest. Hatch due in March. Craig Road at McNamaras’. Activity 9 hours, proving elusive in scrub and pampas. Craig Road at McNamaras’. This guy is well overdue his 6 monthly check but has a habit of roosting (curling up for his daytime sleep) in places I can’t get to. Craig Road at McNamaras’. Has finished nesting with what looks like two chicks from his transmitter’s data stream – first hatch on 19 Sept after 71 days nesting. I couldn’t get close to the nest in gorse and pampas without risking squashing the chicks so have left them be. time at 5hrs (11 hours last nest). At McNamnara’s at Craig Road – Nesting 11 days on 27/6/14 but activity is still 11 hours!. At McNamnara’s at Craig Road – high activity of 12hours. 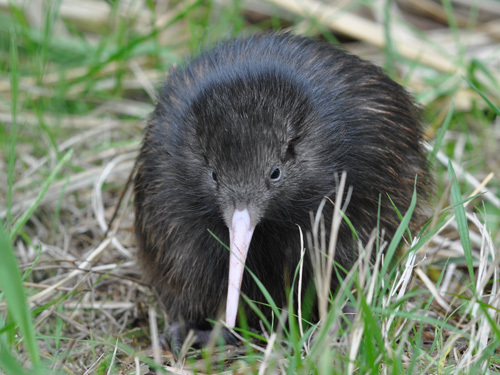 Bill – Has moved to the south end of the Kauri Mt coast and settled in a large area of pampas at Zac’s. His transmitter dropped off as the taped band that holds it on his leg got worn out in the pampas. At McNamnara’s at Craig Road – high activity. At McNamnara’s at Craig Road – high activity after summer nesting. After his 1st egg hatched on 14/12/13 he finally hatched his second chick 24 days later – he was named “Bob” by McNamnara’s. By then the 1st chick had moved out of the nest but I did get to do Charlie’s annual transmitter change at the same time. At McNamnara’s at Craig Road – On nest – he hatched his first ever chick 14/12/13. He is still on the 2nd egg and I have been waiting for his activity to increase before going into the nest. At McNamnara’s at Craig Road – due to hatch his first ever chick any day now. 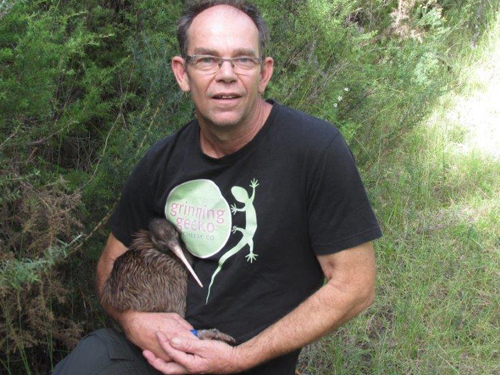 At McNamnara’s at Craig Road – His first nesting attempt failed (which often happens with a kiwi’s first nest – remember that this is just his first breeding season of hopefully 50 or more!). The good news is that he is back re-nesting already. At McNamnara’s, Craig Road – finally nested for the first time. At McNamnaras’ at Craig Road – nightly activity is still high – 11 hours. At McNamnara’s at Craig Road – nightly activity is still high – 12 hours. He is now coming up to 4 years old so hope he starts breeding soon. At McNamnara’s at Craig Road – Did his 6 monthly check – good condition 2140g. At McNamara’s at Craig Road – due his 6 monthly check but being a bit sneaky in the scrub there. At McNamnara’s at Craig Road – due his 6 monthly check but being a bit sneaky in the scrub there. Still showing high activity (11.5 hours) at Craig Road – doesn’t look like he will nest this year. Still showing high activity at Craig Road – doesn’t look like he will nest this year. Still showing high activity at Craig Road. This young fella is showing no signs of finding a mate and is quite happy in the scrub north of Craig road. This young fella –he is 3 years old this month- is still enjoying the single life.